Wondering when the best time is to replant trees or aerate and seed new grass? Randy McKinnon and Thomas Cruthis, the owners of Carolina Green Lawn Care and are proud to help! With well over 10 years of landscaping/lawn maintenance experience, Carolina Green Lawn Care offers a full range of proactive and customer focused landscaping services including complete lawn maintenance, irrigation (installation and maintenance), grading services, landscape design, snow services, landscape installation, and turf treatment applications. Randy McKinnon was accommodating enough to sit down with us and answer a few questions on plant replacements, lawn care, and general landscaping topics. Q: When is the best time of year to remove and replant plants/shrubs/trees? Why? A: The best time to replant trees, shrubs, or any other landscaping elements would be in the fall. The temperatures are cooler overall; not only air temperatures but ground temperatures as well. Less water has to be applied to the plant in the fall as well which saves on water/irrigation bills. 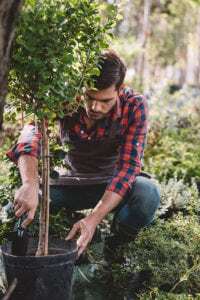 It also gives ample amount of time for the shrub and/or tree roots to firmly establish themselves before the extreme heat hits. However, we still suggest watering for the first year after the planting and thereafter for healthy growth. Also, fertilization and disease control is a must for your investment to thrive. 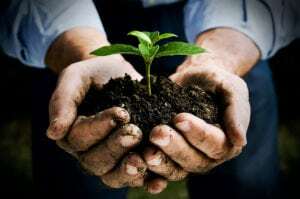 Removing plants can be done anytime throughout the year with no specific time frame; however, some analysis of the soil and other conditions should be made if the plant didn’t survive. Q: When is the best time of year to aerate and seed grassed surfaces? A: The best time of the year to do lawn aeration is in the fall. When figuring out how to plant grass, it’s important to know that most grass types planted in our region are “cool” season grasses (Fescue). Typically during this time temperatures are cooler and rainfall is adequate. Once you have a break in the weather and temperatures are below 60 at night time, then it is the ideal time to do core aeration and overseeding. Spring time is risky because typically you are wanting to treat with pre-emergents to prevent crabgrass and other weedy grasses. However, doing this stops the germination process when seeding the lawn/turf. Even if you aren’t using a pre-emergent during this time, weather patterns are very erratic and can create uncertainty when wanting to aerate and seed. I always suggest fall time core aeration and overseeding and using a local seed that is a cool season grass and has been made for the soil. Q: How long does grass take to grow, typically? A: New grass growth continues from the time of planting and ranges 5-30 days; when temperatures are right for proper growth. However, the amount of moisture and wetness will dictate the germination process. We suggest that you typically stay off grass for at least 12-14 days after being done, and if the whole section is entirely new grass we would recommend 3-4 weeks. During this time it is best to not to use a large machine but rather a push mower for that area to let the new root system grow in. Q: If my grass is brown in the colder months, does that mean its dead? A: Most cool season grasses will lose their color in extreme heat and extreme cold weather. The grass is dormant when this happens and it’s trying to reserve its nutrients to stay alive. Once soil temperatures get cooler and moisture levels have balanced out, grasses will begin to thrive again. For more shrub and tree planting tips and for help with planting grass and landscaping advice, check out Carolina Green Lawn Care’s Facebook page!